All our telemarketing staff are Australian based. You can be confident that when we make calls on behalf of your business, we know the areas being targeted, we have a solid understanding of your industry and we can relate to your clients. Despite the rumours telemarketing is not dead. There is little doubt it has been seriously damaged by overuse and poor practice but it is something you should incorporate in to your marketing strategy. Telemarketing has really just moved its position in the process from the first line of attack to a progressing element. 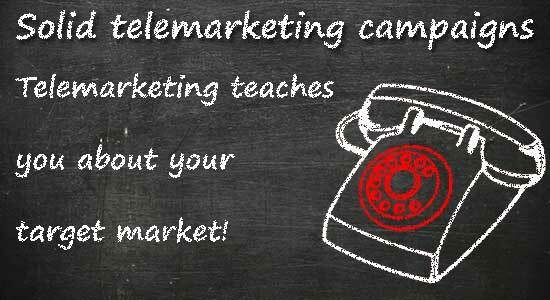 DLM Marketing will not provide a cold calling telemarketing service. Cold calling is make an unsolicited telephone call to someone in an attempt to sell goods or services. Our telemarketing services are suited to companies wishing to conduct market research or follow up after an initial targeted marketing campaign. An example of this could be a follow up phone call after an email marketing campaign has been performed. Depending on the campaign and scope of service, our agents can make between 10 and 15 calls per hour. All our telemarketing staff live in Australia and speak fluent English. We don’t outsource telemarketing services unless it is the request of the clients. DLM Marketing will take care of everything, we will research and write the dialogue to be used by our staff. A call list is prepared which our trained staff will work through and make notes. After the telemarketing campaign has been completed we will provide you with a detailed report.